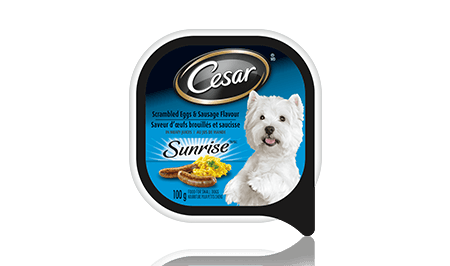 Breakfast just got even more delicious with the newest addition to the CESAR® SunriseTM breakfast line. Your dog's sure to go crazy over this meal! CESAR® SunriseTM Scrambled Eggs & Sausage Flavour in Meaty Juices is formulated to meet the nutritional levels established by the AAFCO Dog Food Nutrient Profiles for maintenance.